KIEV, Ukraine -- Ukraine's parliament has accepted the resignation of the general prosecutor, who had been criticized for not doing enough to tackle corruption. 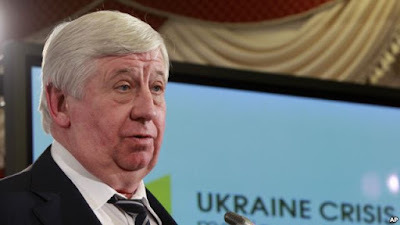 Then-General Prosecutor of Ukraine Viktor Shokin speaks during news conference in Kyiv, Feb. 16, 2015. Ukraine's parliament accepted his resignation on March 29, 2016, who had been criticized for not doing enough to tackle corruption. The move comes a day after several hundred protesters rallied outside the parliament building calling for Viktor Shokin to step down. President Petro Poroshenko had asked Shokin, who was considered one of his closer allies, to quit. Poroshenko has also asked Prime Minister Arseniy Yatsenyuk to resign because of failures to deal with government corruption. Yatsenyuk survived a February confidence vote in parliament, but continues to face pressure to step down. Abromavicius submitted a letter of resignation last month because of government’s perceived attempts not to pursue high-profile corruption cases. Parliament has yet to decide whether to approve his departure.